This is a pretty traditional dish - silken tofu drizzled with chili oil and soy sauce, with an interesting twist: the "tofu" is actually soymilk set into a delicate gel with hydrocolloids, a technique from Corey Lee of Benu restaurant. It's a modern play on tofu that I'm sure purists scoff at, but makes for a fun dish and the texture works here. The soy sauce here is also flavored with bonito flakes, making it a "mentsuyu" sauce. Corey Lee's original tofu recipe calls for a Thermomix, which is a blender that is capable of simultaneously heating its contents. They are quite expensive and uncommon in American home kitchens, so I blended all the contents before cooking separately which worked just fine. 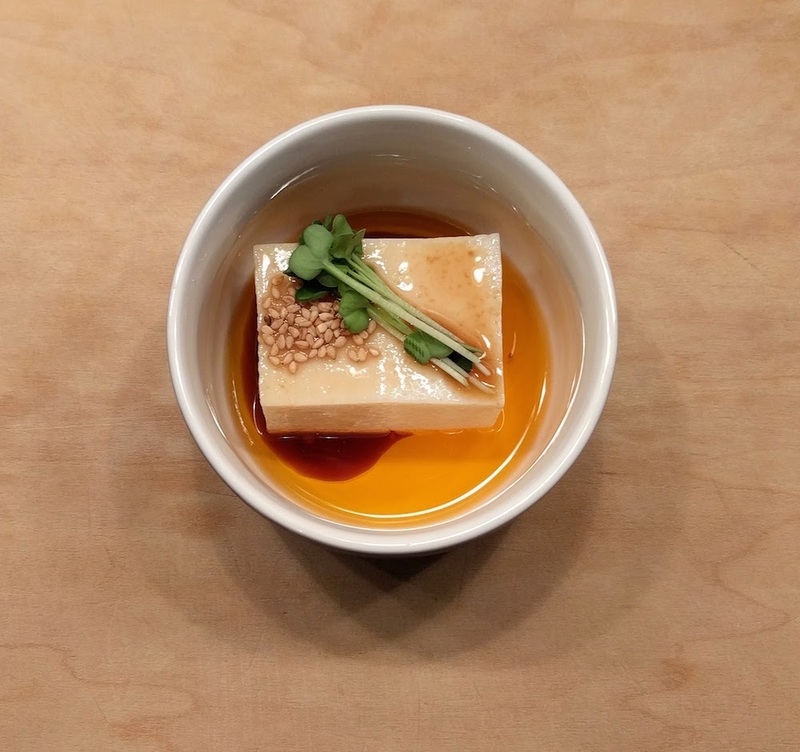 At Benu the tofu is shaped into tiny buns that are garnished and served as a single bite on a spoon; here we're taking a slightly different approach serving a larger block garnished with the sauces. One note on the end result - while it's a passable imitation of real tofu when served cold or at room temp, the gel is not heat stable and will melt back into goop if you try and sear it! Prepare the chili oil (you can do this many days in advance). Be very careful preparing this recipe, as dried chiles are serious stuff. Consider wearing gloves, and watch what you inhale. Blitz the dried chiles in a food processor until finely ground. Transfer to a heatproof bowl. Heat the rice bran oil in a pot to 275F; do not exceed this temperature by too much. Pour the hot oil over the dried chiles, stir well, and let cool. Once cooled, stir in a small dash of sesame oil, if using. Transfer to a jar or storage container and keep in the refrigerator. The oil should last for at least a month. Prepare the mentsuyu sauce: Combine all ingredients in a pot, bring to a boil, then strain. Reserve in the refrigerator. The ratio is 2 parts shoyu and 2 parts mirin to 1 part sake; you can scale as desired. Prepare the silken tofu: blend all ingredients thoroughly, then strain into a pot on the stove. Bring to a boil while stirring occasionally to hydrate the gums. Once boiled, strain into a tupperware or other mold. If you have a blowtorch, you can use it to remove surface bubbles at this point. Chill in the refrigerator until set, at least 2 hours. I used a 5" x 5" square tupperware, and had enough for a block about 1 1/4" high, which was just right. To serve: remove the tofu from its mold and cut 4 blocks for serving of the desired size. My blocks were no more than 2" to a side to fit in small ramekins and I trimmed off a "rim" caused by the non-flat bottom of my tupperware. Add a spoonful or two of chili oil to coat the bottom of your ramekin. Top with the block of tofu (gently; it's fragile! ), and drizzle over a spoonful of the mentsuyu sauce. Garnish with sesame seeds and daikon sprouts. Serve.